You’ve scaled to the towering peak via ropes, bridges, and spider webs, and are now perched some 50 feet in the air on a small platform. With your heart thudding in your chest, you step into the abyss, until your foot lands on a shaky dinner plate-sized disc. You take a deep breath and work your way across the 25-foot expanse to the next platform, reminding yourself once again not to look down. High Gravity Adventures offers big thrills for sure, but the new aerial park next to Tweetsie Railroad in Blowing Rock has garnered excitement for more reasons than one. That it is the first adventure course of its kind in the High Country is a boon for the region. It’s also the first commercial course to be owned and operated by Todd-based Challenge Towers, which has built aerial adventure parks and ropes courses for others around the world. The lofty playground, which opened in April, offers three progressively higher and more challenging levels, ranging from 15 to 50 feet. 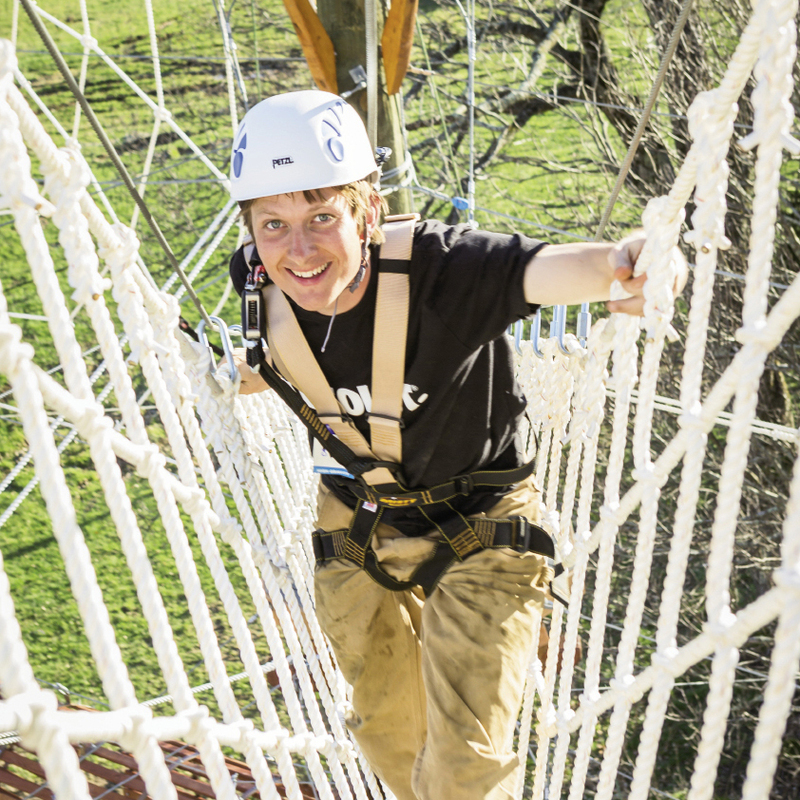 Guests, who are connected to the course via a built-in steel cable and full-body harness, climb and navigate through a maze of more than 75 aerial elements, including cargo nets, aerial bridges, and tight-rope walks. There’s also a separate, smaller course for kids ages four to 10. And plans are even in the works to add a zipline course and 65-foot free-fall tower in 2016. Jacquot and his Challenge Towers team have built ropes courses and aerial parks for more than 20 years. The company’s projects can be found from Florida to California, including at several North Carolina locations, and in a smattering of foreign countries—India, St. Lucia, Ecuador, Mexico, and most recently, Jamaica.